Yo Hablo Ingles (YHI) is the very first ELL adult program of its kind offered at Casa Chirilagua. It has been made possible through the incredible leadership of German and Paola Gomez along with Edgar Lopez-Jimenez from The Mission Continues, and many other dedicated volunteers. Students learned English language skills based on their abilities, ranging from basic grammar and conversation up to communicating with their children’s teachers and landlords, applying for a lease and discussing weekend plans. “Now when I listen to people on the street, I recognize the words we have been learning. When I leave class, I feel motivated. As I get home, I tell my children, ‘Today, I learned this. I feel like I’m learning. I’ve taken classes, but now I feel I’m learning,” remarks Carla who is another proud graduate. 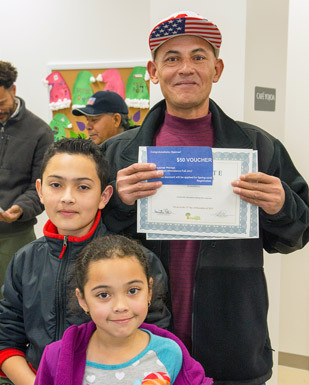 Fifteen adult students recently received their certificates of completion alongside their children, families, and friends in attendance. This celebration was full of delicious food, smiling faces and personalized certificates. Students and volunteers excitedly scrambled to take as many pictures together as possible – capturing the bond they had developed throughout the YHI classes. The Yo Hablo Ingles program has helped encourage and motivate the adults of the community. Not only are they challenging themselves in improving their English skills but they are setting a positive example to their children and their neighbors. We can’t wait to see the next class of YHI students arrive this February!